MLK, Jr. Station continues thematically where the adjacent J.B. Jackson, Jr. Transit Center leaves off: telling the story of the community that surrounds it, framed in the context of the larger African American experience. 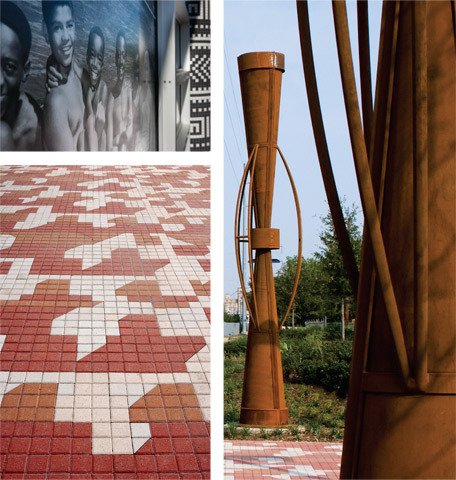 Conceived by artist Emmanuel Gillespie, the station extends the "Walk of Respect" from the adjacent transit center, creating a common motif to join the two facilities. The paving pattern picks up right where the one from the transit center left off, while the columns are made up of monochromatic tiles. Symbols from African kuba cloths - a form of textile art, similar to tapestries - are used on both the walk and the column cladding to symbolize such concepts as unity, respect, wisdom and understanding. The windscreens feature images from noted local photographer R.C. Hickman, who documented Dallas' civil rights era. The photos tell the story of the city's African American community during that turbulent time. In a separate piece of commissioned art, sculptor Steve Teeters created two 17-foot African "talking drums," historically used for storytelling and long-distance communication. Just as these drums helped to pass ideas from one generation to the next in African culture, the ideas of Martin Luther King, Jr. live on for present and future generations through this station's artwork.